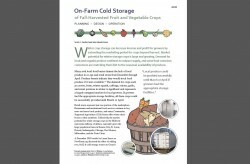 On-Farm Cold Storage of Fall-Harvested Fruit and Vegetable Crops is an in-depth look at the planning and designing cooling for late season and winter storage but it also is useful for general cooling as well. This was written by Scott Sanford, Distinguished Outreach Specialist, UW-Extension, and John Hendrickson, Outreach Program Manager, Center for Integrated Agricultural Systems, University of Wisconsin-Madison. This publication is available for purchase from UW-Extension in print or digital download.